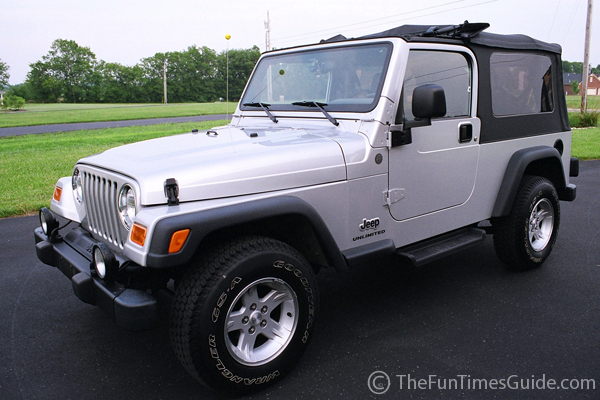 Our 2004 Jeep Wrangler Unlimited has been one of the best (and most FUN!) vehicles we have ever owned! While this brief overview about the Jeep Wrangler Unlimited covers most of the basic points, what follows is an overly detailed review of the Jeep Wrangler Unlimited — from my own firsthand experience. Call me corny, but I like the comfort and fit of the seatbelts. Jim has made the same comment already. They rest lower on your hips and stay in place softly across your chest — without binding you into place. Plus, they’re adjustable near the door frame, so you can position them for a taller person or a shorter person. I love the rearview mirror. It’s got a feature that we’ve always longed for: a compass/temperature display. Jim’s Ford Explorer used to have that, and with all the road trips we take, it really comes in handy. In fact, we like to try to get lost on backroads just so we can try to find our way back to civilization — and the compass really comes in handy for that. There are NO blind spots. Not only is the rearview mirror great because of its compass/thermometer/auto dimmer features, but it’s also really modern and gives you a view of the entire rear of the vehicle — including most of the sides! And the side mirrors on the doors do the same thing — they also give you a different perspective than I’m used to. Plus, when the softop is on, the windows are placed practically along the entire sides, giving you a perfect close-up view of what’s right next to you. There’s LOTS of head room. Jim and I are both very tall. In our ’90 Wrangler, our head is fairly close to the ceiling… or so it seems. In the Unlimited, we’re nowhere near! There is lots of room inside the cabin of the Jeep Wrangler Unlimited, making the ride itself more enjoyable, because you don’t feel “confined” or “swished in”. The windows are tinted all around you — both the glass (windshield & full doors), and the soft top (vinyl windows on the sides and rear). They’re not that really dark, heavy tint, but they certainly appear darker from the outside than they do from the inside. Plus, they help to deter thieves, as you can’t really see what’s inside (when the full top is on) unless you open the door. The cargo space is amazing. Our first weekend of ownership, we packed up the Jeep and took it on a camping trip. Inside, we loaded it with camping gear for 4 adults, 1 child and 1 dog! It was tight, but that’s a lot of gear! We were amazed how much we could fit inside this Jeep Wrangler, including 3 tents, 1 cooler, 6 chairs, and a ton more. Since then, our Jeep Wrangler Unlimited has become the best dogmobile ever. Our dogs love Jeeps! The upgraded leather steering wheel is really soft and durable. I’ve always got a great grip of the wheel, and it feels good. It feels “rich”. The front seats pop up and out of the way which makes getting in and out of the back seats pretty easy. Combined with the attached sidestep at each door, it’s a simple step up-and-in for the rear passengers. 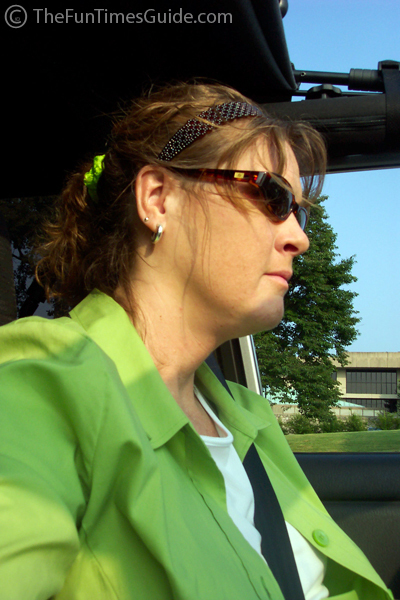 I’ve saved the best for last… It’s a given that I love the top-down feel and the wind blowing through my hair. But the Unlimited models have an extra feature: The Sunrider soft top includes a “sunroof” feature in addition to the full top-down ability. So, by folding the soft top back over the driver and front passenger, you create a 45×23-inch sunroof opening that is larger than the typical glass sunroof. 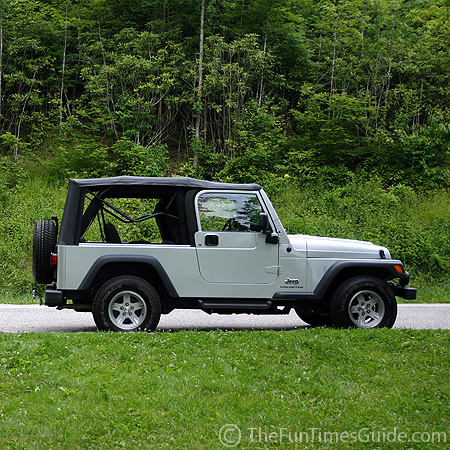 Fellow Jeep owners will enjoy our step-by-step video showing how to open the Sunrider top, and how to put the entire soft top down altogether. What took us an hour-and-a-half to do the very first time, now takes 10 minutes tops! Not only are things like “eating while driving” and “talking on a cellphone” driver distractions… I’d have to say that so is HAIR IN THE EYES! I need to figure out a better “do” for all this Jeepin I’m about to do. As a passenger in Jim’s Jeep, I could deal with it on occasion. But as the daily driver in my own Jeep, I need to have a better plan of attack, before I get fired for looking like I walked in straight from the beach each day! Check out these convertible-proof hair products! There’s no “scan” on the radio! Can you believe it? !… In this day & age, for a vehicle to NOT have my favorite radio station??? Ah well, at least there’s a built-in CD player. On a related note, the gas pedal itself is very touchy, so even a slight depression propels the Jeep forward (…and consumes about 2 cups of fuel at the same time!) I have to remember to use a lighter touch on the gas pedal, that’s all. Or use the cruise control more. We’ve actually noticed a difference in gas mileage between a trip where we primarily used the cruise control, and one where we didn’t. The side mirrors are a tad bumpy while driving. Then again, Jim likes that the ride is a little bouncy. This is trivial and doesn’t even bother me yet, but on long drives it might: No arm rests on the doors. But trust me, this one BARELY made it onto the “con” list. Instead of an armrest with a flat ledge, there’s a thick plastic grip that you use to pull the door shut. No biggie. 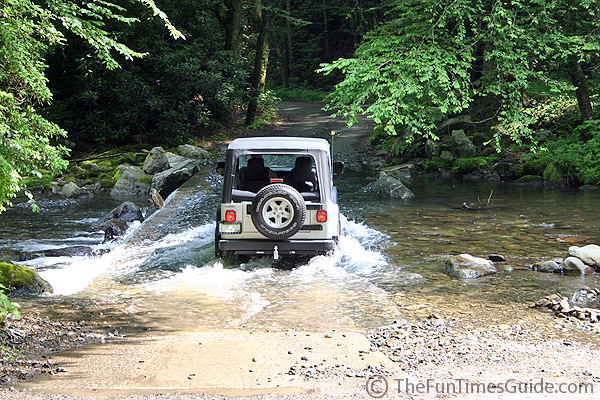 It takes a hefty step up to get yourself into this Jeep. I’m tall and it’s still a conscious effort for me to maneuver my way inside. There’s no anti-lock braking system (ABS) available on Unlimiteds, which means that stopping on wet pavement could prove to be a bit tricky at times. The floorboards up front tend to collect a lot of heat. If you ride around barefoot alot (like me), then you’ll notice the heat a lot more than when you’re wearing shoes. The full metal doors aren’t “easily” removable. They’re bolted on in some fancier way than the doors on our ’90 YJ are, making them a pain to take off. No one told us the proper way to roll up the back window, so take it from us on this one: remove every visible particle of dirt before you roll it up to feel the breeze through the back window. We didn’t, and we drove 3 or 4 days that way, not realizing that even the most minute particles of dirt and grit scratch the heck out of that vinyl! It’s permanent, too. Here are some great tips for Jeep windows. 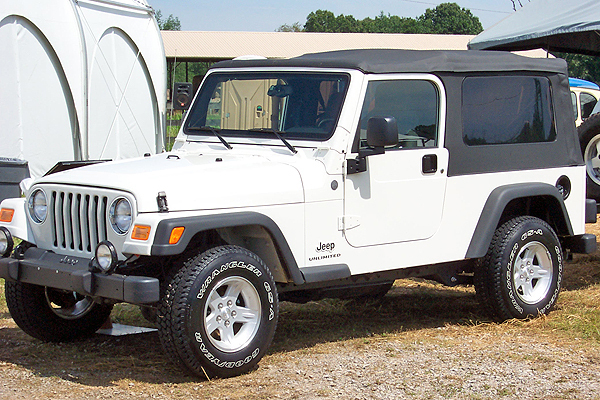 Here’s a summary of the top 20 pros and 20 cons of Jeep Wranglers. 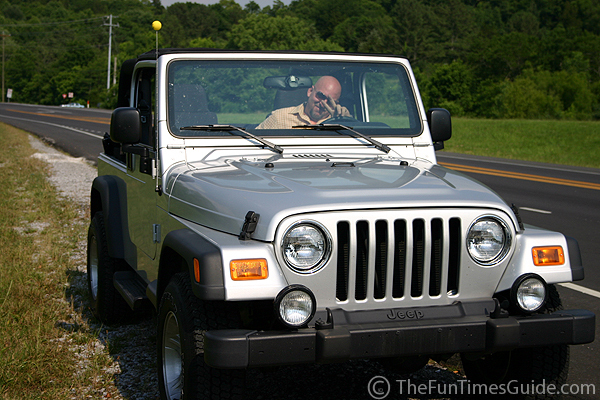 The ride is a little bumpier than most new cars — but that’s because it’s a Jeep! Jeeps have a different suspension (Jim, feel free to pipe in here anytime…) that accommodates for the rougher terrain off-road, but also makes you “feel” the ride more on the highway. This isn’t really noticeable. Okay, maybe it is. But it isn’t really unbearable. No way. I liken it to a roller coaster ride — where you feel the bumps differently in the front cars than you do the back cars. I sense that the Jeep’s suspension is similar, and that’s what I’m feeling. However, over bumps and holes themselves, the ride is remarkably smooth! Just like any other new car. In fact, the suspension is so much better on this Jeep than it was on my ’99 Grand Cherokee that the bumps are less noticeable now. Good thing we don’t smoke because there isn’t an ashtray in this thing! That’s a first. There’s a spot for an ashtray, but it’s covered with that thick plastic dashboard molding instead. And there are two (2) cigarette lighters on the front console. Wait, I take that back… there are two (2) cigarette POWER ADAPTER slots on the front console — for all your mobile electronic gadgetry. There’s not a “lighter” with heating coils anywhere to be found. The real deal about Jeep Wrangler Unlimiteds. For the most part, it’s all positive. Some of those things on the “con” side were pretty nit-picky… just to have something to put on the list. Every day, Jim tells me: “I think this is one of the best purchases we’ve ever made!” And I have to agree. It’s comfortable. It’s practical. And, it’s FUN! 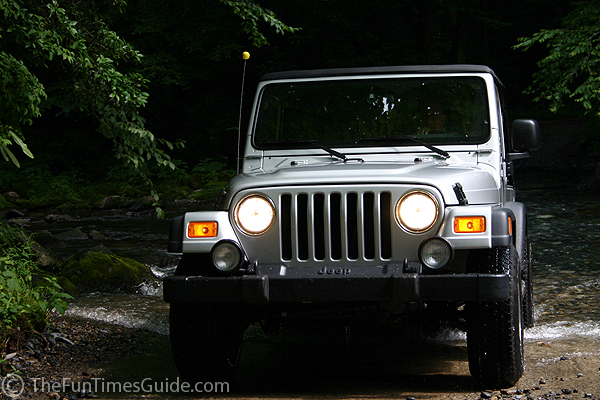 Check out all our favorite Jeep stuff! We learned from experience (and from others who said they heard a “popcorn popping” kind of sound sometimes with their soft top attached) that you will hear strange sounds if the brace that has an upside down “U” shape piece (on both sides over the door areas — where the release clips are) is not perfectly placed over the railing that it’s intended to rest on (when putting the soft top back on). The “U” shape is such that it fits perfectly on the bar — but if you’re in a hurry and don’t check its placement, it could end up not even ON the bar that it’s supposed to rest on. So, if you’re ever hearing a strange popping noise when your soft top is in place, that may be the cause. 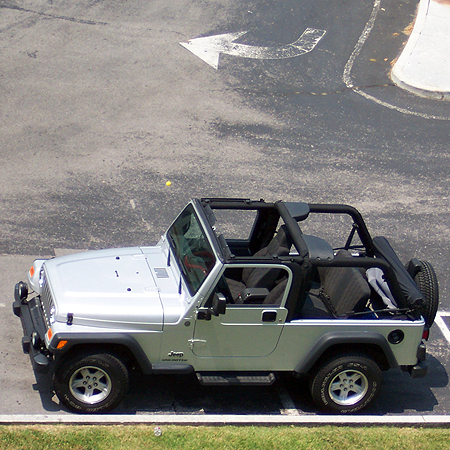 Thinking of towing your Jeep Wrangler Unlimited?